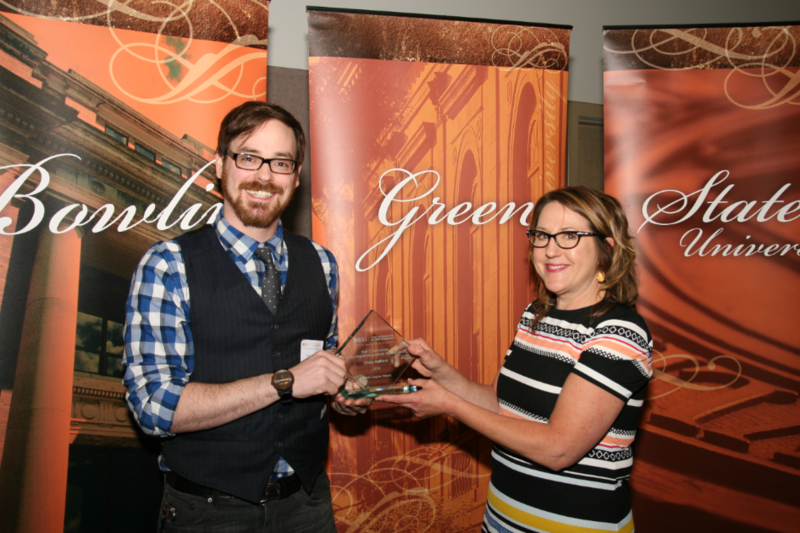 Senior graphic design student, Chris Hatfield, is the 2015-2016 recipient of the Kurt E. Hofmeister Outstanding Undergraduate Student Award as part of the 6th Annual Community and Civic Engagement Awards. The Kurt E. Hofmeister Outstanding Undergraduate Student Award is, in a nut shell, an award based on community outreach, engagement, and improvement efforts (read more). We asked Chris about his efforts and thoughts on receiving the award. Can you describe your project for those who don’t know? My senior thesis began as an investigation into the constructs of systems presenting themselves as rational and efficient modes of executing an agenda. This theme presented itself most visually through glitch art and the intentional breaking of software systems to result in a visual artifact as evidence of the underlying apparatus controlling the perception of the machine. In the case of glitch art the break down of software systems was an elegant solution to showing the cracks in our perception of systems due to the speed with which I could create evidence to the contrary whereby the users will outstrip the confines and abilities of the system which the user acts upon. The metaphor was messier and harder to tangle with in the real world and that really drew me further into the concept. I moved into the real world to investigate the breakdown of systems and the latent impact of errors in our lines of “social code” or cultural past as it were. For me the observations became pragmatic in that my city (Toledo) is located in the Rustbelt decline of the Midwest. Many homes were lost or shuttered in the financial meltdown instigated by subprime mortgage lending and CDO abuse on Wall street. The areas of my city most hurt were those already most vulnerable. Low incomes and economic/social poverty is rich in the African American communities of my city, and we remain a highly segregated city. My investigation uncovered a history of redlining, white flight, economic downturn, and insurance abuse. Indeed, multiple insurance companies have lost lawsuits to homeowners in my city dating as far back as 2001. A readily available resource in these communities is, sadly, blight. Foreclosed, bank owned, or marked for demolition is a standard tag for homes in our city. A $14.5 million grant was issued to take down homes and derelict buildings in our city, and around 2 homes per week come down in our town. My initial investigation was pixel based, using the base unit of visual expression on screen. My materials changed to brick, the base unit of home building from the period of many homes in our area. Serving as the foundations of both the homes and of a community as opposed to a wandering society, these bricks were both pragmatic and appropriate subjects for my use. I guess you could say I became “activated” during this process. The antiseptic investigations in the design lab lost their charm for me quickly. I realized my enjoyment of breaking systems could serve a larger purpose, and my ability to understand the ways in which long game, latent results of broken systems such as our housing situation positioned me to do something about it. The time frame of a thesis is an artificial barrier, but I needed to chunk the project down into something I could deliver on. After walking the city and alleyways with my friend and somewhat of a community mentor on this project for me, Yusuf Lateef, I came to understand that often the process of blight removal benefits homeowners but does little for renters or community members directly in a financial sense. In the here and now of today, the long game of improving the city doesn’t help keep these residents or their children in a stable and uplifting environment. To me, a culture of poverty and crime is a depressant and the circumstances of much of our city are derived from the original error of pseudo scientific racism. I took a direct interest in working to fix this detestable error in our past, and the bricks would be the vehicle which I could work with. I imagined a way to move these items from their current state to their desired state. How could I move rubble back into the conversation, have them recognized as ruins and monuments but more so as living artifacts with identities and histories calling attention to both the objects past and the past/future of our circumstances? I knew that I could leverage my abilities to support leaders doing the powerful work of community building, and I began to take meetings with The Arts Commission of Toledo, and through them Americorps volunteer Lindsay Akens. This investigation led me to attend meetings and take part in intimate community meetings with the dedicated leadership of the Old West End Neighborhood Initiatives (OWENI) who work to create programs supporting youth through stipends as they mow blight property, mow elderly neighbor’s property, deliver newsletters door to door to improve community cohesion, and also repaint and repair homes in dire need of support owned by elderly or otherwise incapable residents. These efforts struck a chord with me, and I solicited them for input and advice on my project. Their support and authenticity helped me to understand that my work was valued and would have a real impact on the community by providing financial support. 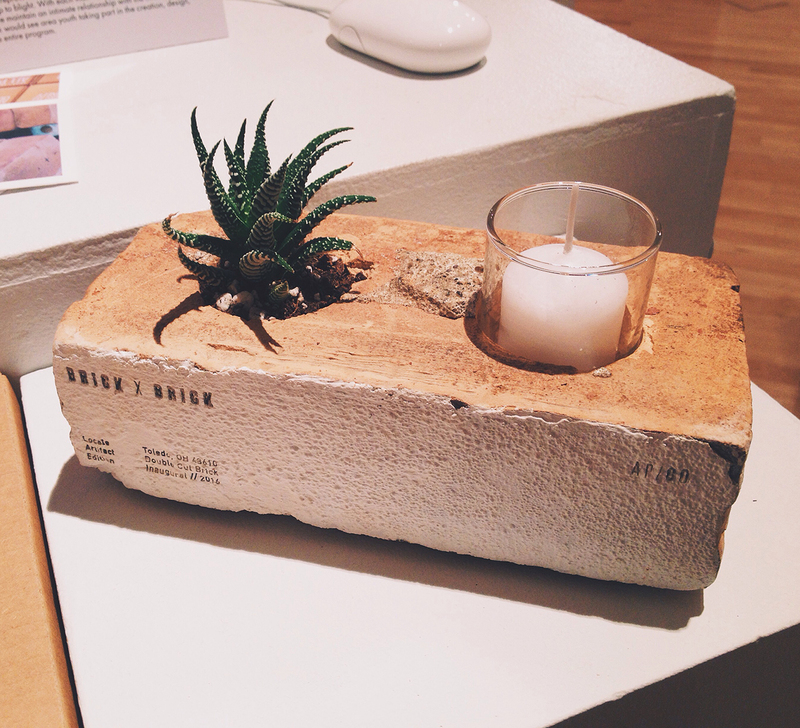 My bricks became unique design artifacts where I converted them by hand into planters and votives, each cleaned, edition with a laser, and hand worked into a one-of-a-kind piece. These unique design pieces, each pulled from the foundations of a blighted property, carried with them the original patina and wear of the site, and feature engraved zip codes to identity the location of the site. A small edition of 25 bricks was created followed by a complete branding for the mission called Brick X Brick (brick by brick). I ordered blank kraft boxes and supplies which I hand screen printed into a production that features handmade aspects at every stage of the work. 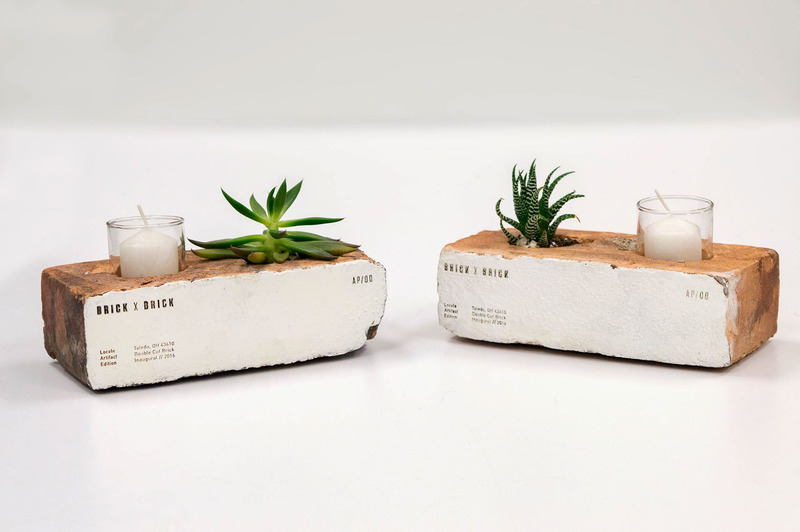 Each package is filled with hand screenprinted packaging, a local Libbey Glass votive and candle, a unique brick, a hand made duplexed gold foil edition authenticity card, and a hand made print featuring process work of the project. The entire package aside from the bubble wrap can be recycled as it is made completely from paper, cardboard, and hemp. After completing this work, I launched a website and online store selling these bricks to consumers across the country. At the time of this writing, I have three left due to a payment processing error at the day of the gallery show. When sold in entirety, I will have transferred this blight into $1500 of community support. This money will be donated to OWENI for our first recipient. 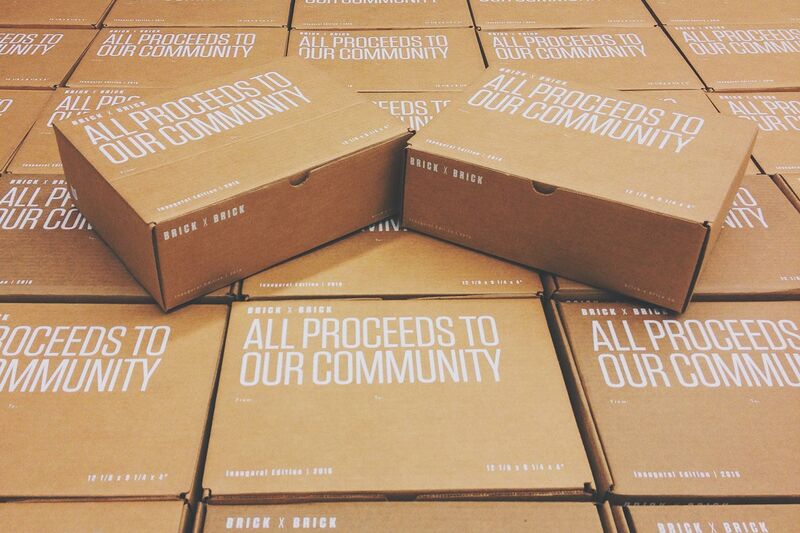 Brick X Brick can feasibly be replicated across any community in any city dealing with blight with limited editions released on behalf of geographic locations, specific community actions or needs, or institutions serving the community. What does it mean to you to have been nominated for this award? To have won? It means that taking action and working on behalf of a social agenda has value and is recognized. I think often work of this nature is seen as a portfolio piece but not particularly viable, when in reality my senior thesis almost accidentally became a functional business that would be in the black by the fifth edition and could continue supporting the community. To win an award recognizing the intense amount of labor and work it took to get this together and off the ground I feel a bit of solace to the great cost incurred in spurring a new idea like this, but the reality is an award is only helpful in that it raises the profile of the mission. At the end of the day, projects like this must not burn the community it seeks to serve. Becoming wrapped up in awards and things of that nature would be antithetical to providing the support to the partners I’ve made in this process. Nonetheless I am humbled and honored to receive recognition for what began as thankless work doing the dirty, hands on process of trying to right a wrong and fix the breakdown of our social code. Thank you for shining a light in this little window. Please check out www.brickxbrick.co to read more about OWENI and to purchase the first edition! Also I have to give many thanks to Jessica of Oh Sew Betty! at Handmade Toledo for the space to work and make a mess with the bricks, Arts Commission of Toledo for their guidance and thought leadership, Americorps and Lindsay Akens for their guidance and leadership, OWENI for their acceptance and leadership, Yusuf Lateef for his guidance and mentorship, and Jenn Stucker at BGSUGD for her guidance and mentorship. My thanks to you all!